On the penultimate day of the Bengaluru leg, Bengal Warriors, who had beaten Puneri Paltan yesterday, were knocked out of the tournament by the Patna Pirates after a 32-34 loss. Gurvinder Singh and Ravi Dalal dazzled in the match as the Pirates kept their semi-final hopes alive. 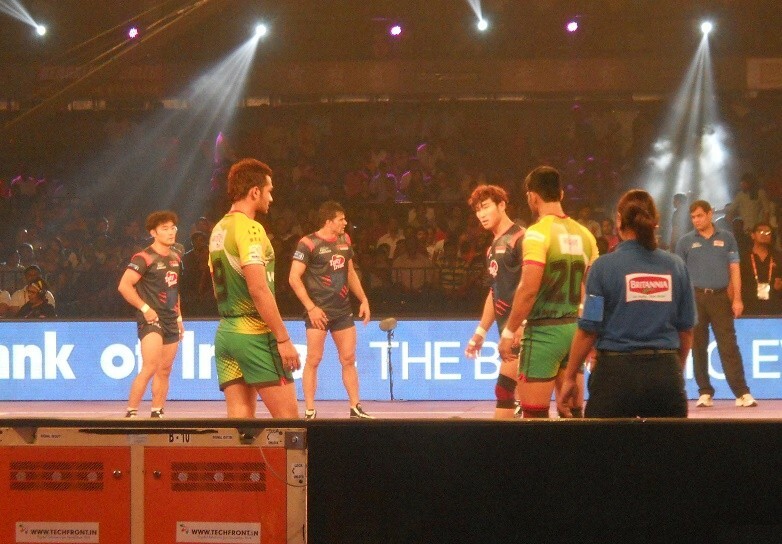 Earlier in the tournament, Patna Pirates and Bengal Warriors had shared the spoils after a 20-20 draw. Ravi Dalal won the first point of the match in the 2nd minute through a raid. With Patna Pirates leading 2-1, Mahendra Rajput scored the first super raid of the match to help his team take the lead, 4-2. However, with Pirates down to 3 defenders, they tackled Sunil Jaipal and Sandeep Narwal levelled the score at 5-5 through his raid. In the 10th minute, Gurvinder Singh won 3 points for Patna Pirates to take the lead at 9-5 and reduce the Warriors to just 1 player. Last man standing, Deepak Dhull won a bonus point, but was caught as the Warriors suffered an all out in the very next minute. With his team trailing 6-13, Jang Kun Lee conjured up a super raid to reduce their deficit to 4 points. However, Gurvinder Singh did not let the Pirates stage a comeback as he stayed on the pitch for the entire half without getting caught a single time in his raids, which saw him gather 8 points. The first half ended with the Pirates leading 18-12 against the Warriors, who were without their captain Dinesh Kumar. The first major action of the second half came in the 22nd minute when Ravi Dalal tagged 3 Bengal Warriors defenders before returning to his half to extend Pirates’ lead to 9 points (12-21). However, Kedar Lal came up with a super raid of his own and this kickstarted a comeback for the Warriors, who went on a 6-point run to make it 18-21 in the 25th minute. This stretch included catching Patna Pirates captain in a super tackle. The Warriors continued their sensational run and took the lead (27-26) in the 31st minute when they inflicted an all out on the Pirates by getting Ravi Dalal out. By the 35th minute, the team from Kolkata led the Pirates 30-29 in this attacking encounter between the teams in the bottom half. With 3 minutes to go, the Pirates took the lead once again when Jang Kun Lee was tackled and they ensured they held on till the end. With the scores tied in the final minute, the Pirates defence rose and completed a 34-32 win over the Warriors, who have now been knocked out of the tournament. The Pirates keep their semi-final hopes alive.